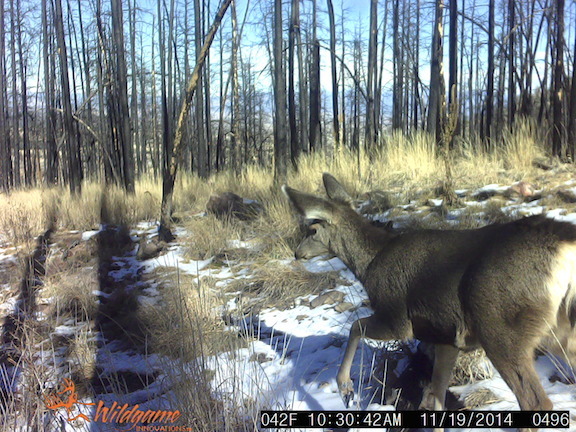 Southern Rockies Nature Blog: Who Came to the Gut Pile? On the afternoon of November 5th, I walked out the back door and hiked to some burned-over BLM land about 45 minutes from the house. Maybe it was my scouting and camera work at "Camera Trap Spring," maybe it was the red gods' favor, but about an hour after leaving home I shot a mule deer buck, three points or four points (Western count), depending which side you looked at — not a huge buck, but since I would be backpacking the meat out, that was OK. I boned the meat and filled my Osprey Talon 22 day pack past its design specifications, I am sure, but it's a tribute to that design that it still felt comfortable, even though heavier than I had ever loaded it. The next morning I returned — with a larger pack —carefully glassing the area as I moved through the burnt pines, lest a bear have found the gut pile, bones, etc. No, just a few crows were flying around and talking. Magpies came first, the morning that I set the camera. So would a bear or other scavengers come? One way to find out — I brought a scout camera with fresh batteries, piled bones, hide, rib cage, and skull with the guts — and set it to cover the scene. Today, twenty-four days later, M. and I went back for it. The deer's remains had been rearranged considerably. The well-nibbled rib cage and spine were a few yards away, downhill. 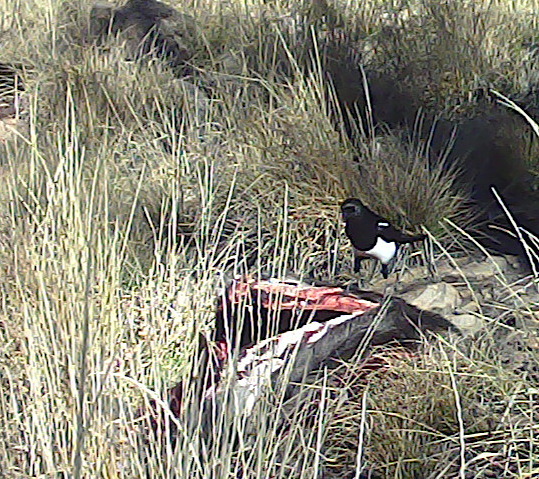 The hide was in several pieces, and the head was not immediately visible. The slideshows are 19 MB and 16 MB, so if you don't want to load them, see highlights below. The bear came later. An ear-tagged bear, meaning it has been relocated once — not like there is any vacant habitat. The golden eagle made multiple visits. The ear-tagged bear has a feast. Of course there were lots of crows visiting, and a couple of ravens and a red fox. And other deer walked past the scene unconcerned. NN: Sorry you're having a problem. They are in .mov format, viewable with QuickTime -- and other video viewers, I think. Do the vultures relocate for the winter? Anne, yes, the turkey vultures usually leave in late September for points south. They return around late April, I think.